This past weekend, I took a little time in the gardens. The cold front that moved through last night brought much needed rain. Bumble-bees are loving the Echinops today. 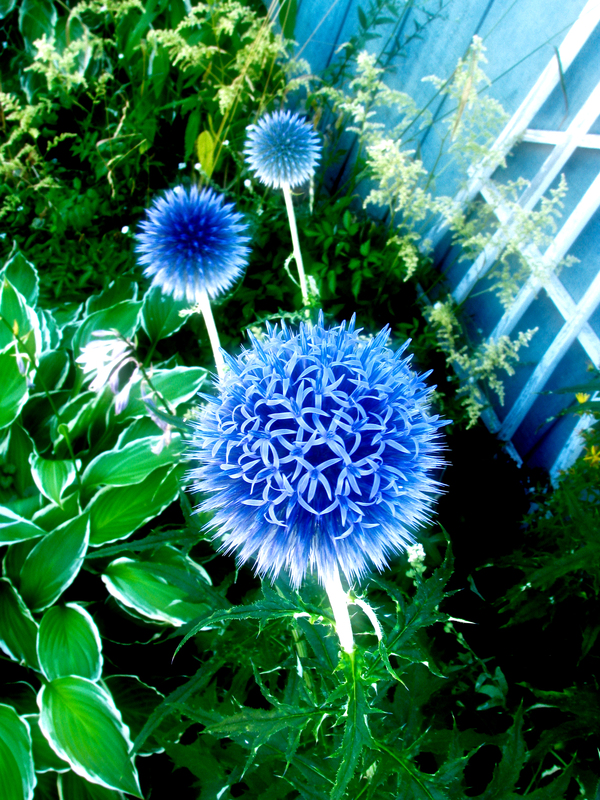 I once read that placing globe thistle near entries and doorways brings protection. I did a search on the Internet today and could not find the mythology of this and I am hoping to write a short-short-story so hope to come back across this information soon. I am most creative and poetic in August. August is a month for no work and I am going to find a way to re-invent myself so I can take whole months for play. My first goal will be the months of August and October! I am thinking perhaps a kickstarter project is in order. A big girl camera should be on a shopping list. I can dream and make it happen. Magical! Posted on August 8, 2011, in In My Own Backyard, Magic Lands, Nature Photography and tagged blue, echinops, globe thistle, messy magical gardens. Bookmark the permalink. 1 Comment. Loved this shot! Those globe thistles are cool flowers and you made them look spectacular in this shot!